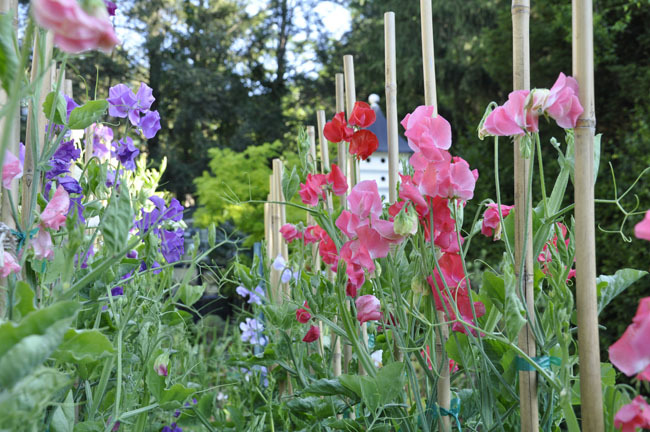 Even though I am still ordering seeds, I am beginning to sow some that need an early start. At this point in the process, I need to organize seeds by the germination requirements, or I risk missing an important date, such as, when to remove a tray of Cuphea seeds from the fridge, or when to subject Tropaeolum seeds to 40º temperatures. Even though I started ordering seeds in late December, there are still many to be ordered, but suddenly it's March 1st, and I am a little late with my seed sowing, so it's time to catch up. I did sow some little treasures in January and February that needed a good, head start such as pink heirloom Italian Cardoon, some snapdragons and even some florist Gloxinia ( Sinningia speciosa), which are so hard to find anymore. Along with some onions, heirloom red celery and leeks, that's about it for seeds sown by Matt so far. Most of these need warm soil temperatures (above 80º F) in which to germinate well, but now that they are all up nd growing, I've relocated them to the cooler greenhouse, which makes room under my lighting system for more trays. How to grow tomatoes from seed. this, tomatoes transplant well at most any stage. 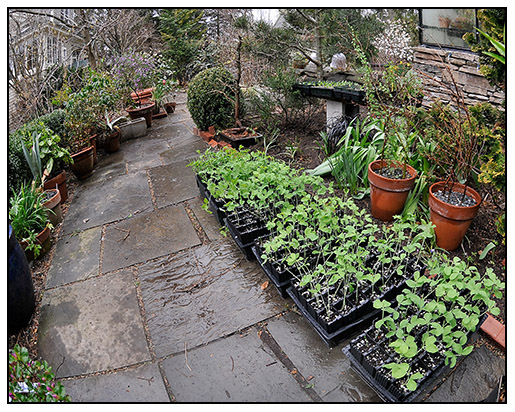 into individual pots before being hardened off and set out into the garden. 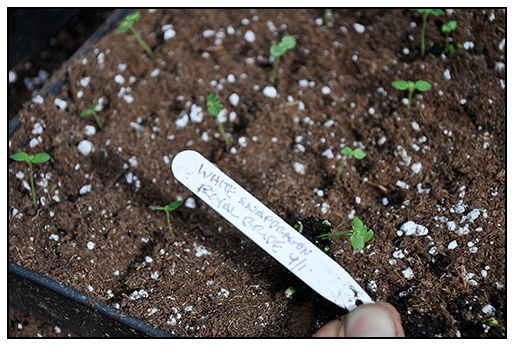 Fair Warning - These tips for starting seeds which I am about to share are different than many which you will see from other garden bloggers. - growing plants is a science and seed starting in particular, can be complex, as much as it can be simple. 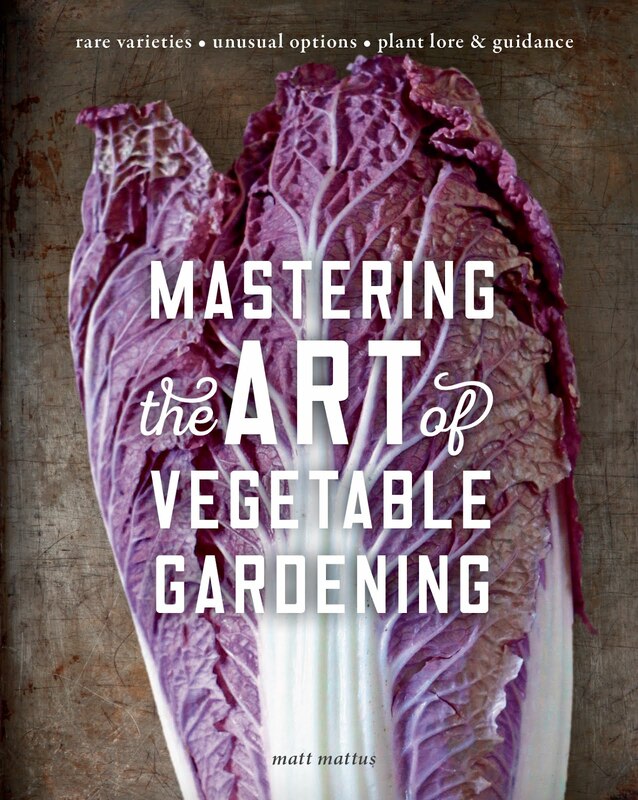 I want to share my most helpful tips with those of you who might be planning your vegetable gardens. 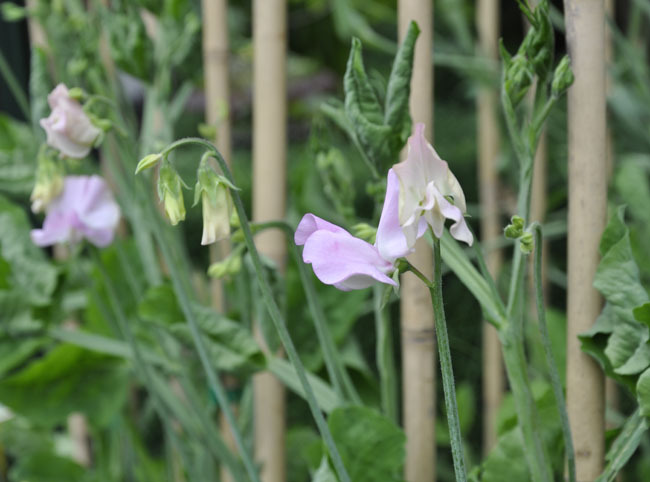 In our world of Pinterest and pretty pictures of egg shell pots with mini moss gardens, when it comes to seed starting, there are no guarantees - seeds cane be fussy, young plants can die practically overnight from fungus, and even malnutrition. 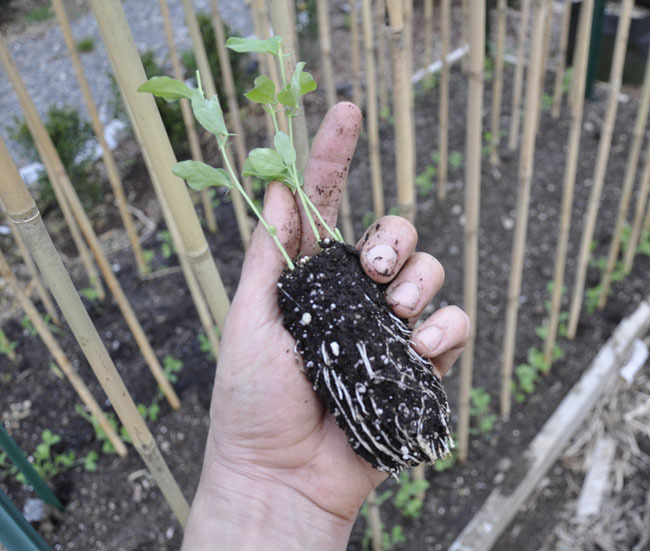 When it comes to starting your own food crops or even flowers - please, don't mess around - seed starting is serious business, and I am about to share with you my best hints and tips to help you achieve greater success. 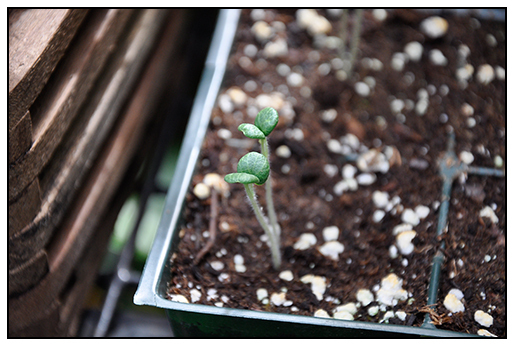 Seed starting can be fun - especially if you are a new gardener, and even more so if you have your kids helping you. I know many moms treat seed starting as a craft, but rather than make it an art projet, seed starting can also be an opportunity to teach science, or, a valuable lesson on 'how-to-do-things-right' – a skill we often forget in our disposable, DIY culture of superficiality and sound-byte practices. One cannot rush seed starting, one cannot cheat, since seed starting IS science - it's a biology lesson waiting to happen. 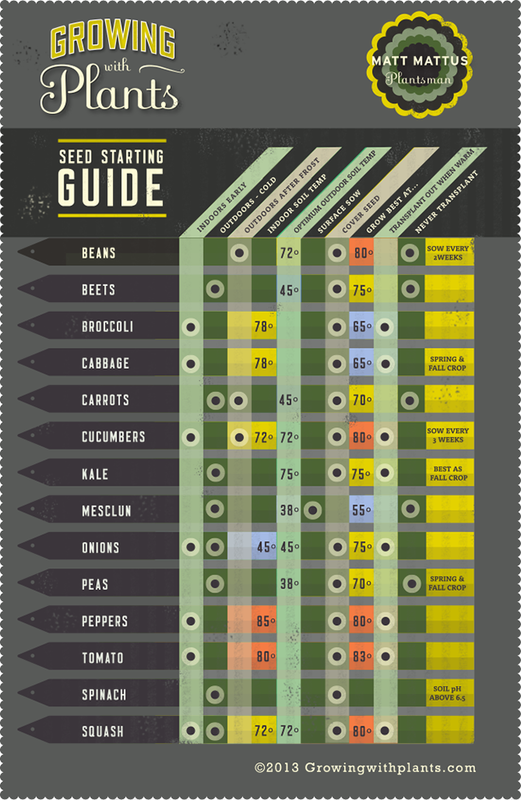 To make things easier for you, I designed this poster showing the basic seed-starting facts for a few of the most common vegetables. Save in, pin it, or print it out to use as a guide. Before I start, I like to do a little ( or a lot!) of research about what conditions the seeds which I am to sow, may require. Even for experienced gardeners, starting seeds successfully and growing them on requires some do- diligence. 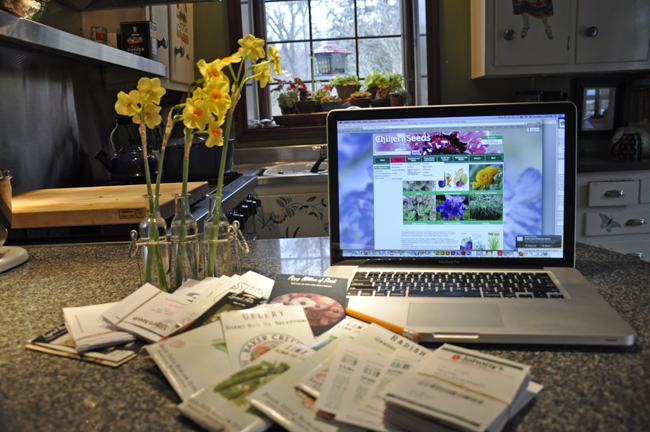 Search on-line, and use the most informative sites such as your local county extension service, plant society forums and university sites rather than most blogs, at least at first. Later, you may want to visit a few of your most favorite and trusted blogs to see if there might be something that was left out of the techy information. What I am trying to help you avoid, is something that we all do when given a stack of seeds - that is, to in the interest of time, just tear them all open, and sow them in any old soil, and water them. 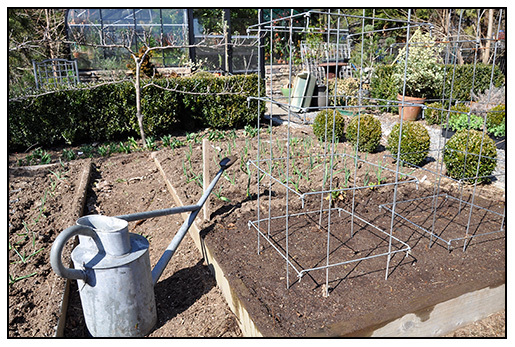 This may work for the easiest of seeds such as beans and tomatoes, but we all learn as gardeners, that even the most challenging seed can be germinated - all you need to know, is what the particular species which you are sowing, requires - environmentally ( temperature, moisture, soil). 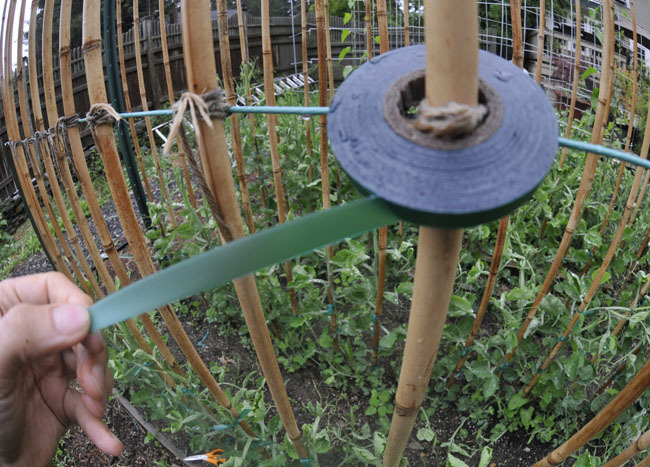 I will admit to you all, that even I with over 40 years of gardening experience, find seed starting as perhaps the single most challenging skill when it comes to gardening - it's where I still have much to learn ( that is, until I try grafting!). I say this all because I see many phrases advice being shared on-line such as like "just plant the seeds in dirt and water, and stand back".These broad statement are generalized, and they are not only misleading, they are often wrong. The entire plant world grows from seeds, and almost each one requires something different culturally. The goal here is to achieve optimum results - not just a few seeds germinating. 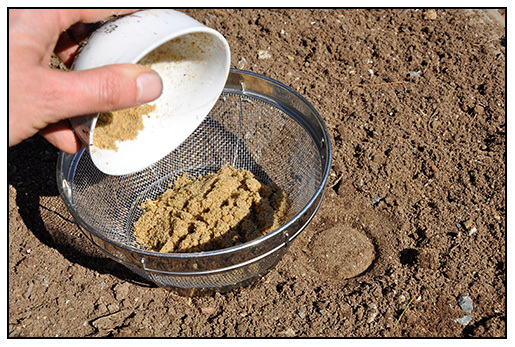 Often, a shift in soil temperature just while germinating may make all the difference in the world. hormones and plant growth regulators, it will also need a good dose of iron - something petunias also need. Some seeds come from plants that grow in tropical climates in South Africa or South America (melons and cucumbers) demand soil temperatures near 80º F, but then again, so do many cold weather crops that you may think need cold soil in which to germinate - cabbage and broccoli come to mind. 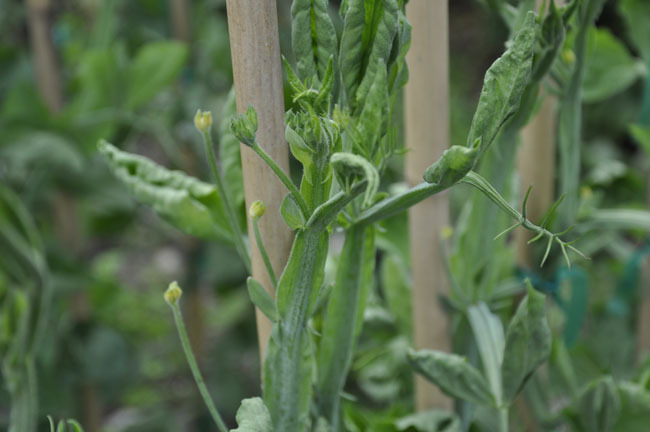 Other plants such as those from central America (tomatoes, zinnias and Dahlias), benefit from light, or surface sown, yet need to be covered with cardboard to block out any light 0 such as Scabiosa. With your garden hosting plants from all over our planet, from South East Asia, China or even from the dry mountainous areas of Turkey. I like to think of seed starting as managing a zoo - where every animal comes from a different environment, penguins to jungle cats, and each need different stimuli and environmental conditions in which to grow properly. just sow and grow - and in no time, one can have hundreds of fall-blooming anemone plants. My 10 tips for starting seeds. 1. Use proper containers for optimum results. 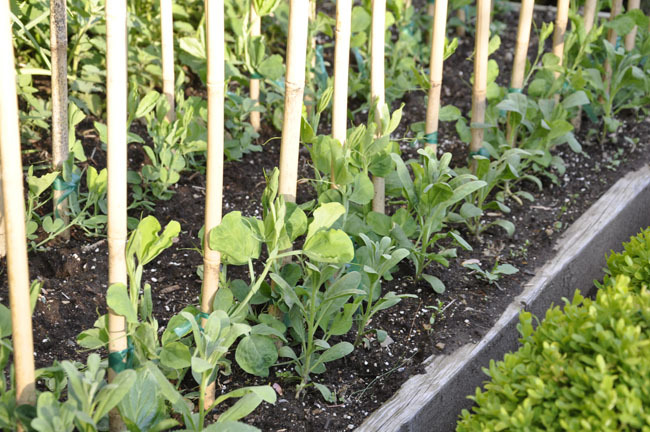 Use deep seed pots for tap-rooted veggies like Artichokes, or wide pots for fibrous rooted veggies like celery. People - Enough with the up cycling when it comes to producing the finest vegetable seedlings. It may make you feel good to recycle white plastic yogurt containers, toilet paper tubes, egg shells etc. 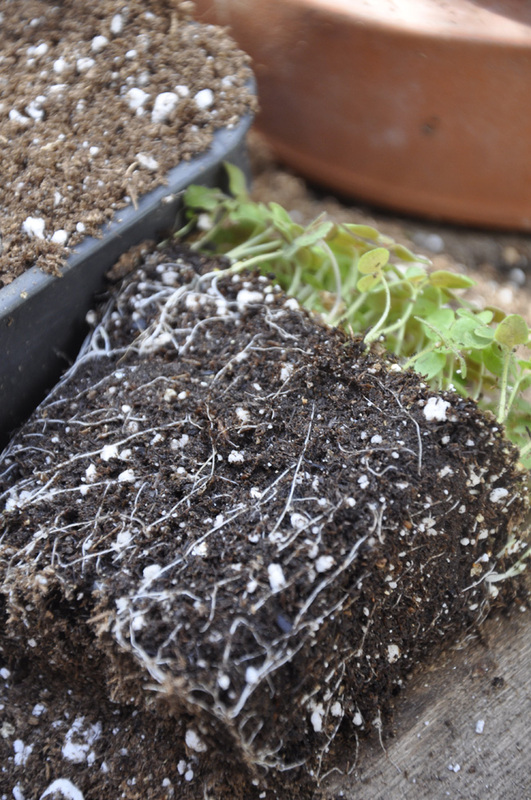 ( and I'll admit that it might be a pet peeve of mine and that there may be nothing wring with using yogurt cups or egg shells to start seeds)- but there are other things to consider - mainly, excellent root growth ( sometimes difficult in white or transparent plastic pots without the use of root hormones) and what about plants that need deep root runs? 2. 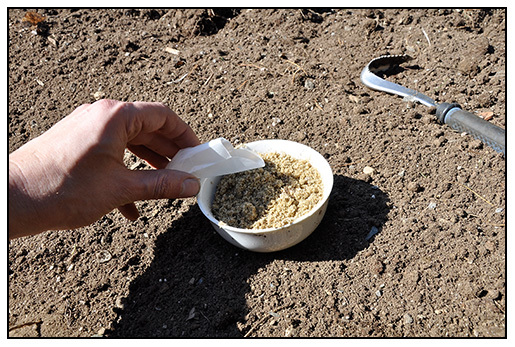 Find out what the optimum soil temperature should be for your seeds to germinate - remember, it's different for each type of plant that you grow. 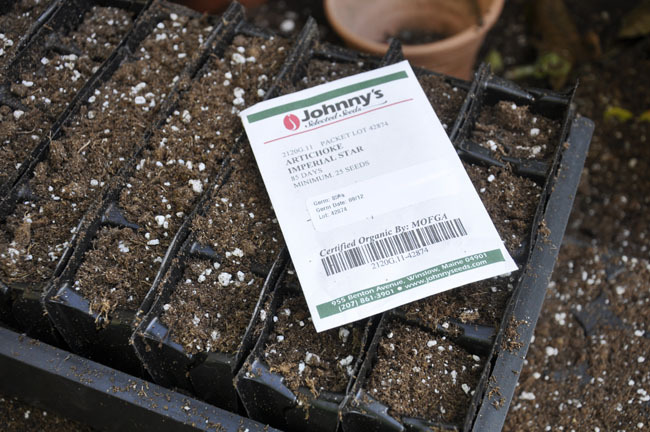 Know what temperature you seed germinates best at is crucial. 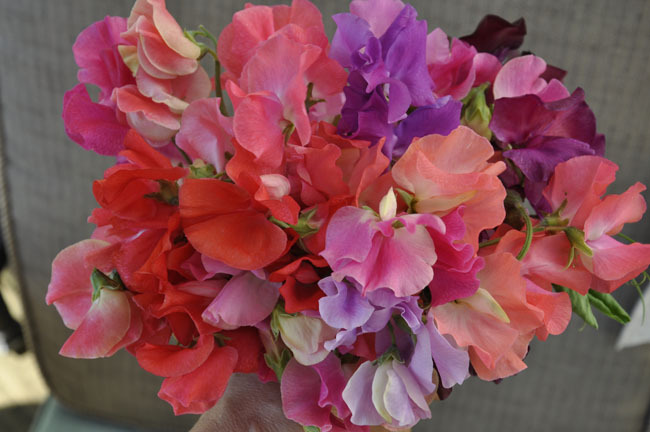 Blindly opening a packet of seeds, and then sowing seed before knowing what it needs is perhaps the greatest error any gardener can make. Lettuce seed germinates best at 40º and poorly at 73º, cabbage seed germinates best at 85º, but then requires bright light a cold temperatures in order to grow well – difficult to do under artificial light systems. Some seeds require stratification ( a cold period), some seeds need boiling water poured over them. Learn first, and then practice.Cabbage may need to germinate hot, but then stay cool, only to be set out into the garden near your frost free date, but something like lettuce not only prefers to germinate near freezing, the seed will often go dormant once the temperatures rise into the 70ºs, which may simply mean that you will need to sow lettuce straight into the garden, but not ever under lights in the house. 3. 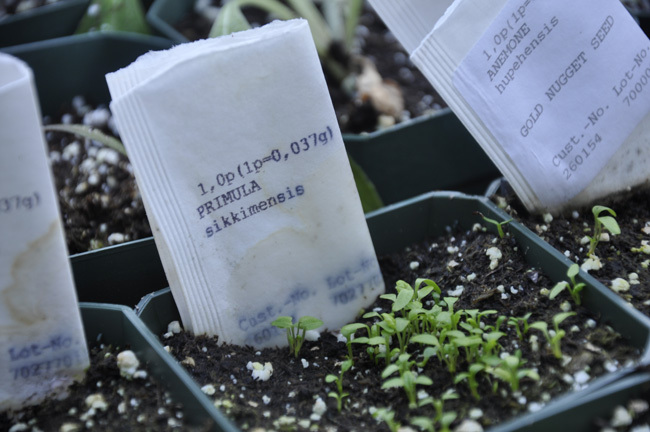 Once your seeds have sprouted, then find out what temperature your seedlings need to grow at - as this is often different than the germination temperature. 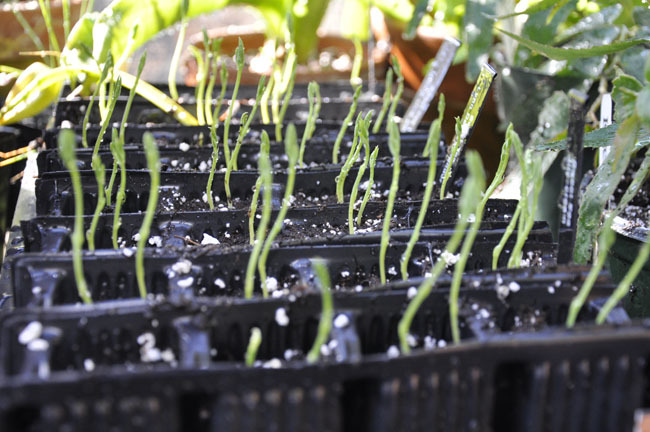 Broccoli may like cool growing temps in the spring, but few people know that need to germinate in hot soil, but then it needs to grow-on in cool conditions, eventually the strong seedlings can be set out into the garden near your frost free date. Yet lettuce germinates best when temperatures are near freezing, the seed hates warmth so much, that it will actually go dormant once the temperatures rise into the 70ºs, so sowing lettuce straight into the garden in March will ensure that you achieve the maximum germination rate. 4. 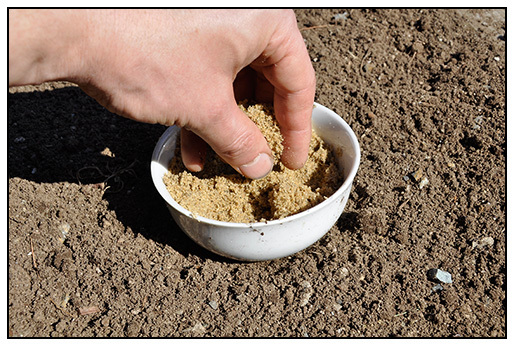 Use sterile soilless growing media, and yes, I advise not using coir for seed sowing. Seedlings are like premature babies, and they need clean, sterile bedding and spotlessly clean diapers or they will get sick. Be a good parent, and you won't get fungus gnats, green algae or insects because poor cultural conditions will encourage all of these things. 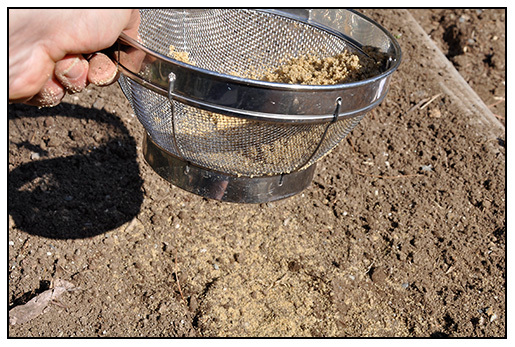 Start with sterile soil-less mix, which means that it’s been pasturized or heated, to kill all of the nasty stuff, and the good stuff will them be added if you can find an excellent mix. 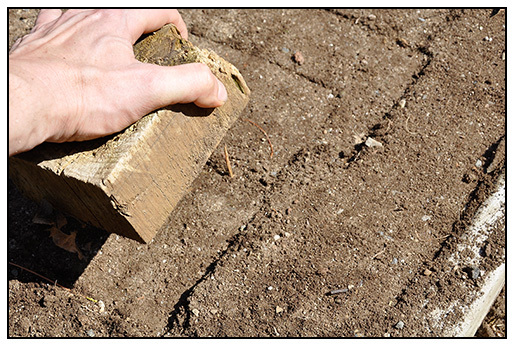 While on the subject of soil – perhaps the most controversial subject that there is in gardening today next to fertilizer and insecticide - all I can tell you is what I use – Pro Mix BX with mycorrhizae. Yeah, it’s a peat based mix, and yes, it is commercial ( but I have yet to find a mix at a Home Depot or Lowes that doesn't look like it was made with pine bark, black hair dye and garbage. So proceed carefully here. There are many Pro Mix blends, and the one generally available at retail in small bags is also not the same mixture, so you might be on your own here. I stay far, far away from coir products ( I just think that they are bad for plants in my opinion – I’ve killed more plants with coir than any other soiless product, and the way it is produced in India isn't all that good for the environment either ( let alone it's carbon footprint). In a year I will be creating all of my own soil mixes without peat, but for now, I still use peat. My two bales are my contribution to global warming. 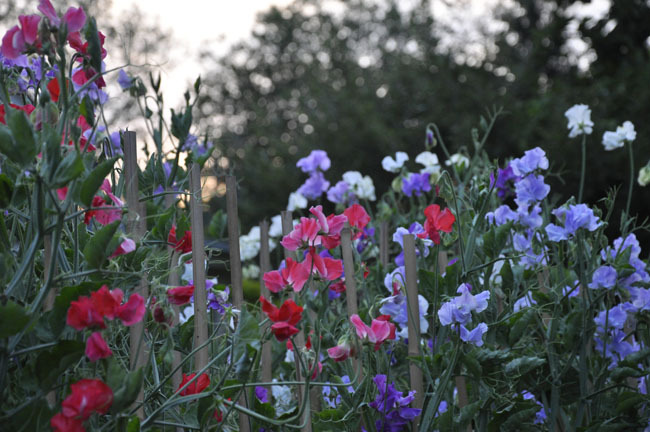 The ideal mix is generally impossible for most people to create - garden soil baked or steamed to kill the nasties, mixed with composted Beech leaves, sharp sand and you could end up with the finest seedlings of all, but the professionals use a virtually clean peat mix, drenched with fungicides, starting with chemicals to stimulate first root growth, and then chemicals to shorten the cell growth so that stems become thick, and leaves dense ( think of those awesome, "healthy looking" tomato plants you will soon see at the big box store). There are chem's to stimulate flower growth so that the flats will sell in full bloom, and you know the results. My use of peat based mix and some water soluble professional fertilizer may be frowned upon by some, but it doesn't come close to what commercial growers use. Be realistic, be responsible, be serious about what you grow, and I believe that there is a middle ground. 5. 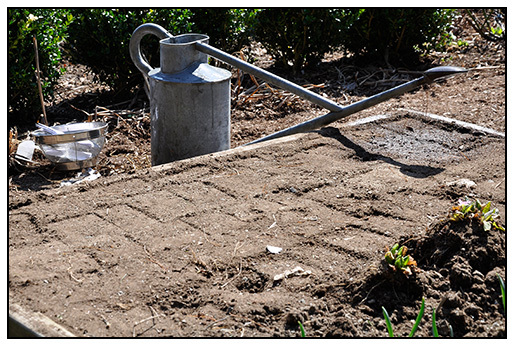 Fertilize often ( weekly) and use the right formula for the right plant. And here is another touchy subject with those who are not serious gardeners. Just don't use 10-10-10. Read-up on what the professionals use, and be careful with those home remedies!!! Look. Save your chamomile tea spray for your evening tea and not to spritz on your seedlings to discourage fungus gnats – these nasty while lies are being spread on social media sites faster than Justin Bieber comments. The real reason why you have fungus gnats is because your soil is too wet, and you are just making it worse by wetting it more. Forget completely about molasses fertilizer, Epsom Salt fertilizer ( it's just magnesium, and most likely, your seedlings don't need just magnesium), - I will say it again – GARDENING IS SCIENCE, and thus, plant nutrition is far too great a subject for me to cover in this post - all I will say is my life changed once I took the time to reseach exactly what formula my pansies, tomatoes or celery needed, and pay attention to what stage of growth they will need a certain formula. No tea bags, no crushed egg shells, no beer. 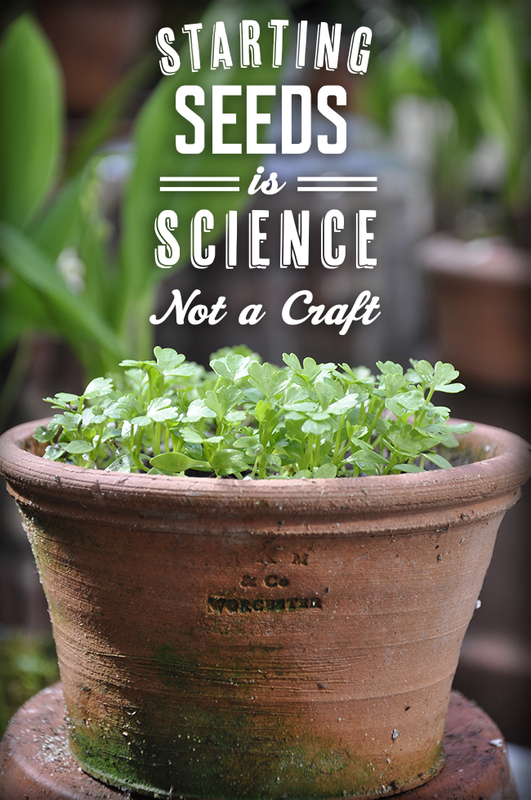 Gardening is a science, not a craft. Baby Snapdragons ready to be transplanted into flats. These were sown in February, and now they have deep, strong roots due to a fertilizer formula that is 5.17.24, high phosphorus, low nitrogen. I’d love to hear from you, if there is one that you love- I have heard that the Lobster compost is good, and Oh yes, I like the composted peanut hull mixes, but again, I am sticking with ProMix for now, black plastic containers, or dark green Kord pots. The only recycled pot I do use are some black plastic take-out containers from our local Chinese delivery, they work well for seedlings, but beyond that, I use clean, new pots. 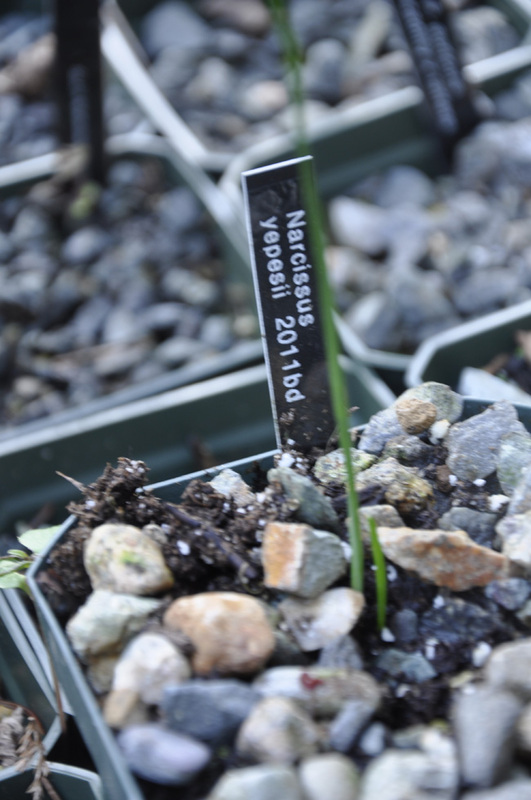 Narcissus is just germinating! Yay! ensures a good crop in the home garden. The lure of home grown artichokes drives many to try growing their own. The truth is, artichokes are not an easy crop, they take up alot of room and the results are usually poor in most parts of the world. Those large, commercially grown green globe artichokes that many of us are familar are primarily grown in a coastal microclimate, the cool, Monterey coast of California for instance, just south of San Francisco, where most of our commercial artichokes come from. 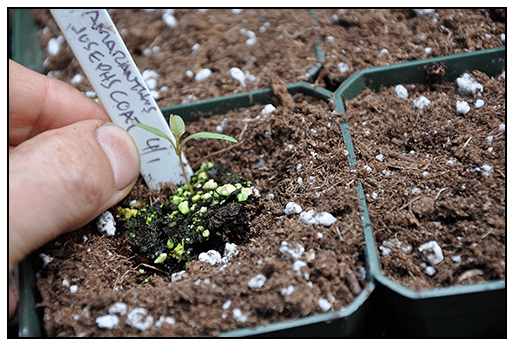 You've undoubtedly seen artichoke seed for sale in seed catalogs, and I think many are curious about possibly growing a few, especially since they start with the letter 'A', I think I get more mail about How To Grow Artichokes than any other vegetable. 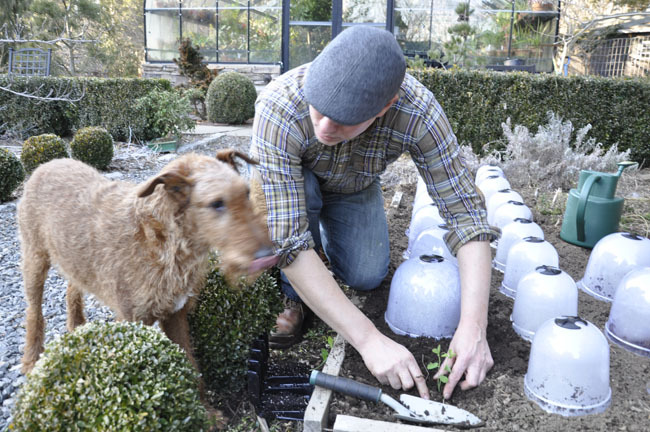 Home grown plants can be rewarding, but one must follow directions strictly, as temperature is key throughout their life. There are times when artichokes want to be warm, and there are times when they want to be cold, and if you mess those periods up, you will just end up with nice, prickly thistle plants and never see a flower bud. 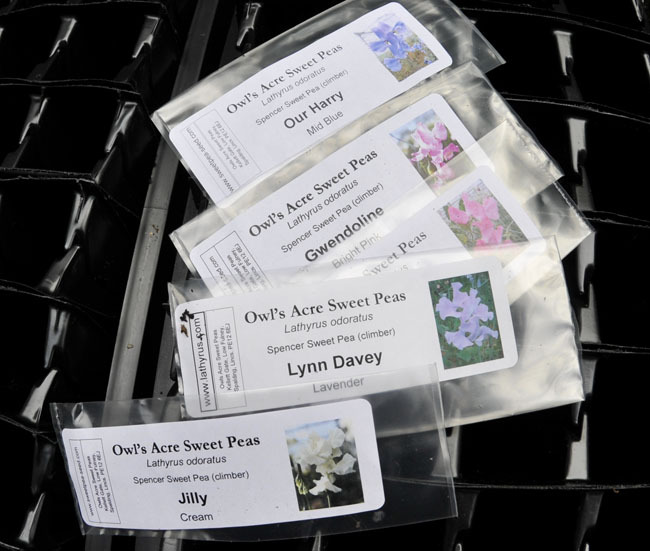 Using some of the newer seed-raised varieties that have come into the market in the past decade or two. Don't be discouraged, you can grow them -just follow these directions precisely, and as late January and early February (right now - go order them!) is the time to start, here I share how I grow mine. 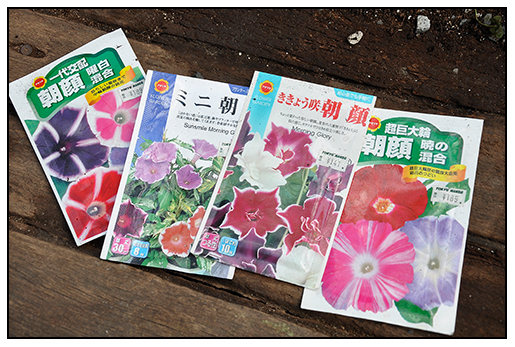 I still have some Japanese Morning Glory seeds from a trip that I took to Japan for work a few years ago. I assume that they are still viable. 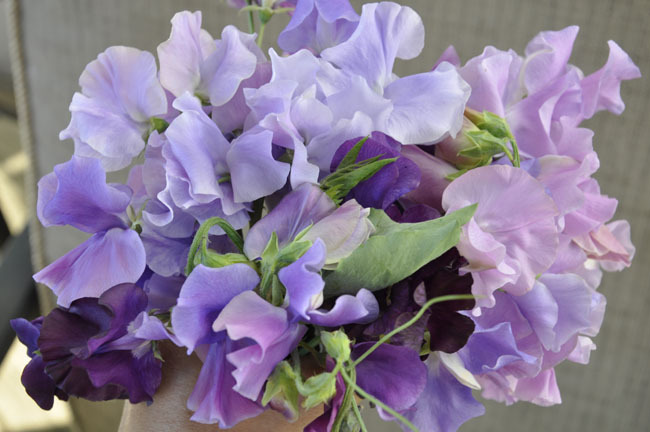 In Japan, the Morning Glory is treasured as a potted plant, and clubs, societies and groups are dedicated to this plant, and the many Japanese cultivars particularly the mutated forms, some that even have shredded petals. I have some books on growing these Asagao ( the Japanese word for these plants), so I may add these to my project list for this year, if they germinate. 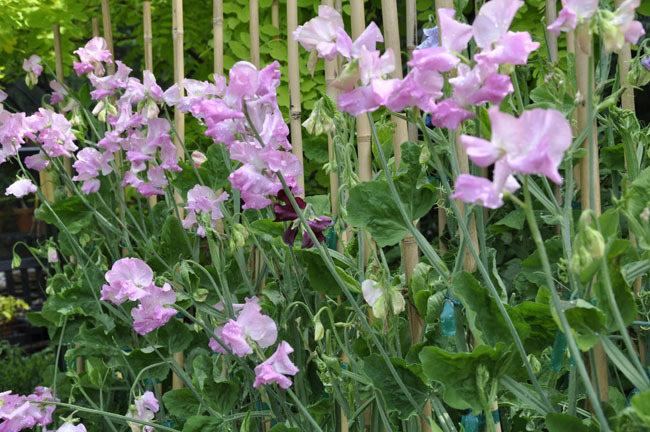 The plants are traditionally grown in small pots, pinched to encourage flowers and dwarfed, like bonsai Morning Glories. Bells of Ireland or Moluccella laevis seeds can be extremely challenging to germniate,, but thanks to a readers tricks, I've been able to get this far. Now, the second harder part - growing them to blooming size. Success at last! 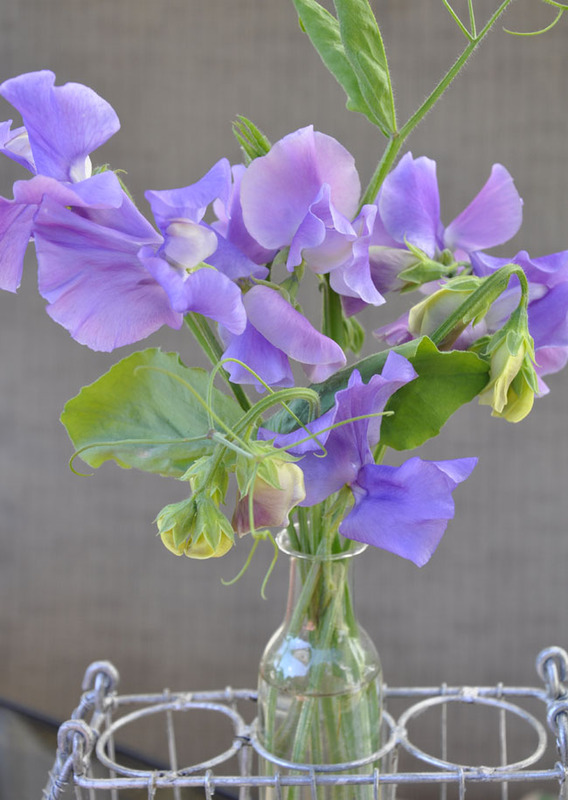 Thanks for a reader of this blog who shared their trick for getting their Bells of Ireland to germinate ( wet paper towels and seed, in a plastic zip lock stored in the refrigerator for three weeks, then sow in individual pots and carefully transplant), I have success - at least so far. Here is a shot of the young seedlings. Arisaema sp. 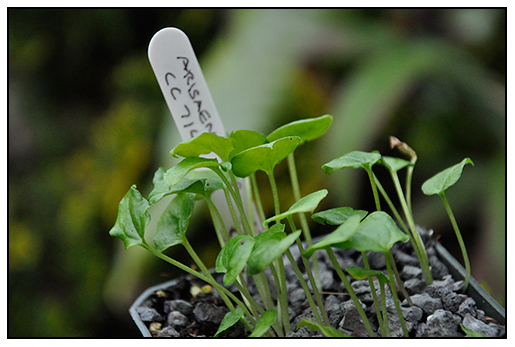 seedlings from the Himalaya will form one leaflet their first year - the rest of the plant is growing underground. Not all of my pots of this genus are showing the leaves, but I know that some species spend all of their entergy underground. I can't research which species I have yet as some are unidenditfied by the collector, and even could be a new species to science. The plant collector Chris Chadwell wrote me today, to ask how the seeds from his last collecting trip to Tibet and Nepal were germinating, so I wanted to share this shot of some Jack In The Pulpits ( Arisaema species) from the Himalaya were doing. I think I'm all set in the Himalayan Arisaema department for now. A Romulea species removed from the sand bulb plunge bed, will spend a month on the back of the potting bench in full sun, where the roots and corms can slowly begin their drying process for their long, hot dry summer dormancy, but most importantly, for these seed pods, which have been produced in profusion. 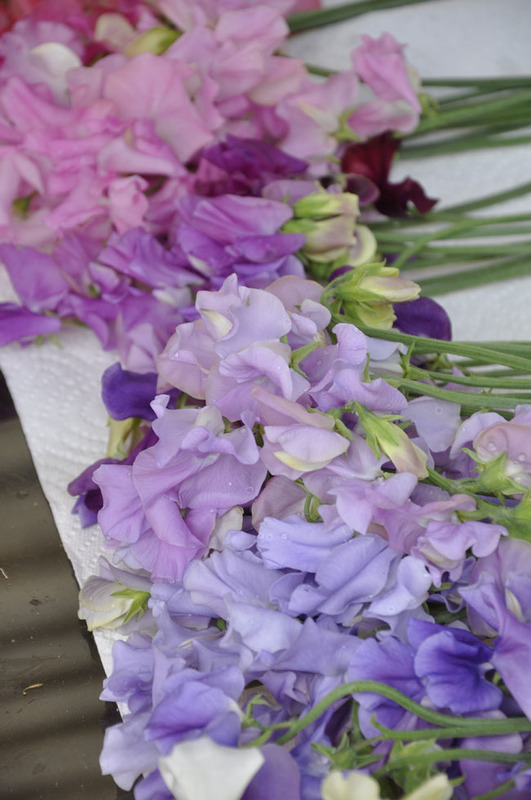 They will dry and split within a couple of weeks, and I don't want the seed dropping back into the sand bed. I place the pot on a white plate to catch any loose seed. The seed will be sown, and not watered until autumn. Sometime, I save my own seed, especially when the plant is rare, or hard to find, such as this South African bulb plant known as Romulea. 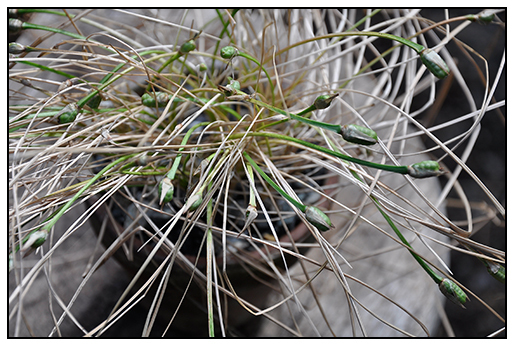 Like many Cape bulbs, the plants set seed profusely, but the plants tend to get rather ugly ( or at least to non-plant people) before the seed pods dry. These pod are almost ripe, so I set the pots on dinner plates, so that the seed can drop onto the plate for easy harvest. Sometimes I am lazy, and sow the seed back into the same pot as the mature bulbs, which is OK with many South African bulbs like Romulea, as they seem to like tight quarters, but also, I share seed with rare plant societies and their respective seed exchanges. Speaking of rare seed, some South African geophytes in my collection produce very few seeds, like Clivia. 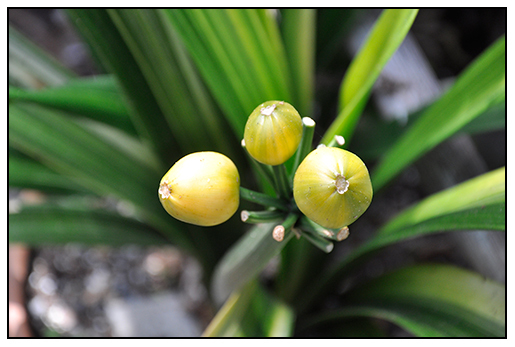 These gems are ripe seeds from a variegated yellow-flowered Clivia ( worth about $1500 each on the black market - really). From Japan, we only have two of these plants that we received from Mr. Nakamura. Red berries produce orange clivia, yellow berries produce yellow clivia, and these are yellow-striped seeds......get the picture? There might be 2 or 3 seeds in each of these fruit, which take about 14 months to ripen on the plant, before they can be sown. These unusual summer dormant geophyte is also from South Africa. Melasphaerula raemosa can be a prolific seed producer. I am ready to share with serious collectors. This is a plant that I will be sharing with plant societies this autumn in plant sales and rare plant auctions. 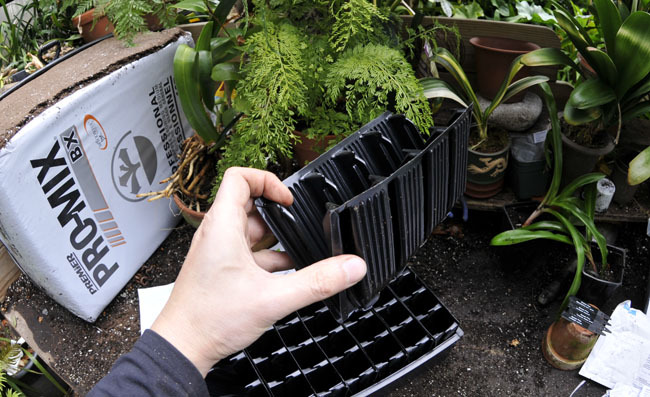 It requires a cold greenhouse for culture in pots, as it is a winter grower. 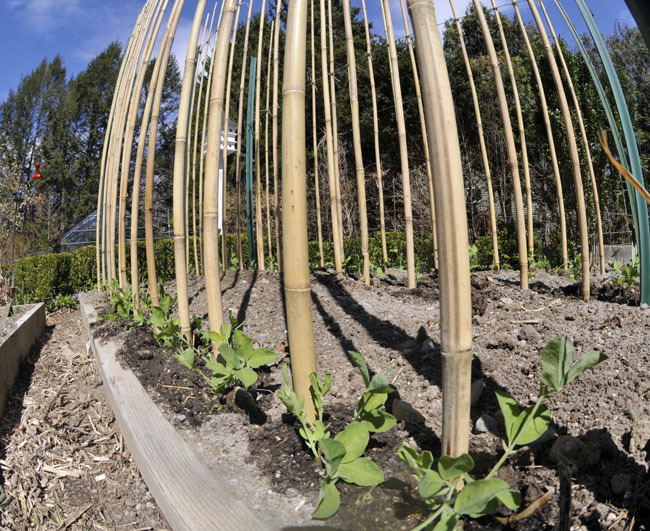 Still planning for the moon border, these snapdragon seedlings have been transplanted into a dibbled grid, and old fashioned method for transplanting seedlings into a large flat. I remember my parents doing this when I was young, especially with zinnia, marigolds and snapdragons - those annuals that can handle being torn apart from their kin in a flat without much noticeable damage. These white snaps may seem small, buy remember, it is still April. 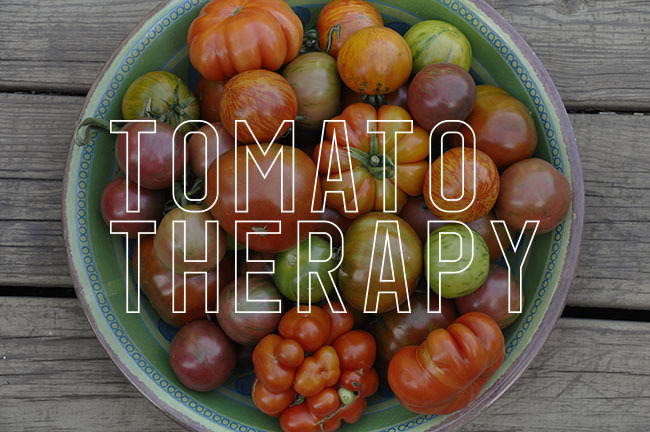 With a hard frost tonight, a lesson will be taught to those who have already purchased their tomato plants from the home center. 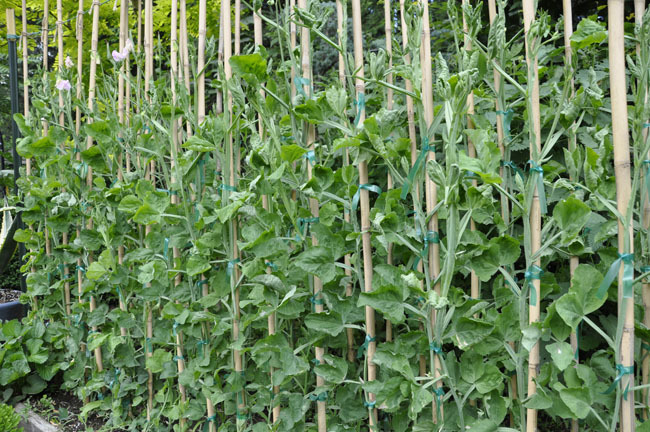 I was shocked at the annuals and the large tomato plants that were available at Home Depot and Lowes last week - it is far too early to be planting any tender annual yet. Memorial day folks, and that is 6 weeks away! Amaranthus dislike any root disturbance, but I've found that an early start still helps plants survive, as seeds sown int he garden directly, can be lost easily. 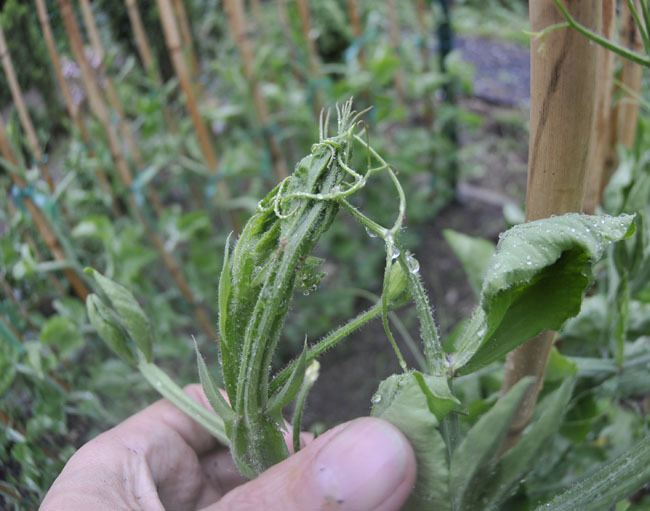 It's always an impressive show - those tiny, nearly microscopic seeds growing into monsters within a few weeks, but the tiny seedlings can get lost if sown in early June here in New England, as weeds will quickly grow around them. 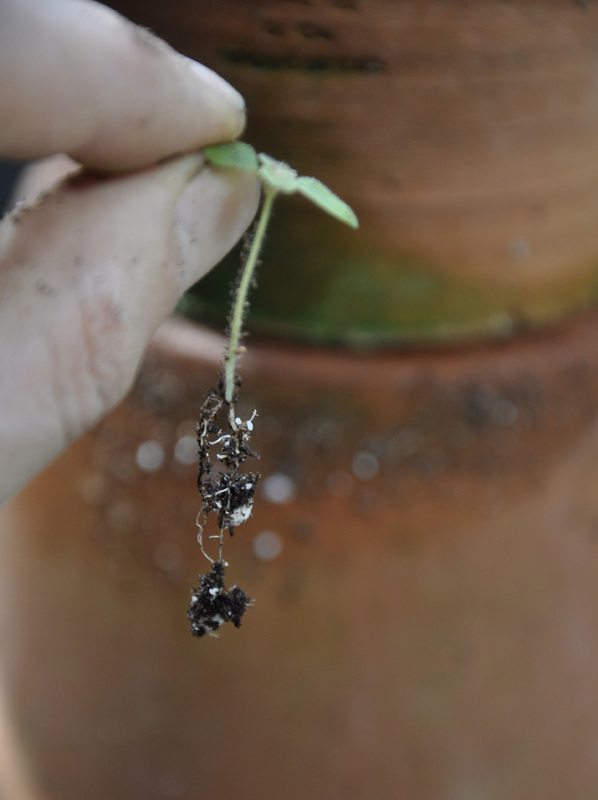 If started early, Amaranthus can survive transplanting if individual seedlings are slid from pots into prepared holes once the soil is above 60 deg. F. I find that the seedling transplant well when tiny. Care must be taken, for one cannot find Amaranthus at garden centers, for if you do, they will be already too large, and they will go into shock an die once transplanted, but if timed properly, a seedling can be stealthly transplanted as long as it is not too large by the end of May. Speaking of annuals that one cannot find at garden centers, Scabiosa must be mentioned. 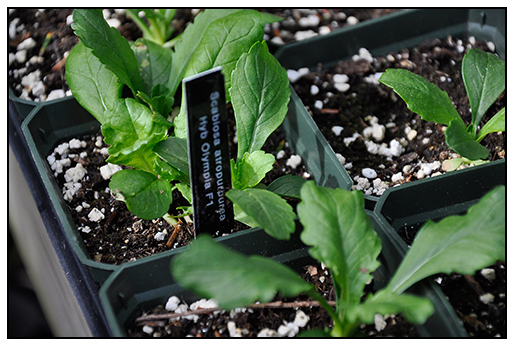 These seedlings are ready to be transplanted from their 4 inch pots into the garden where they will remain, blooming for most of the summer. These tap rooted annuals dislike any root disturbance, and since they will not bloom until mid July, they are rarely carried as 6 pack annuals for sale at retail, as growers know that a plant will no longer sell, if it is not in bloom, so only the annuals that are bred for early bloom are carried by nurseries. These, you will need to grow from seed yourself. 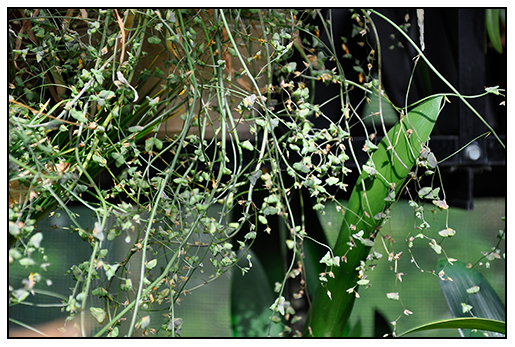 The wiry stems and long lasting flowers ranging from near black to pink, are a favorite of mine. 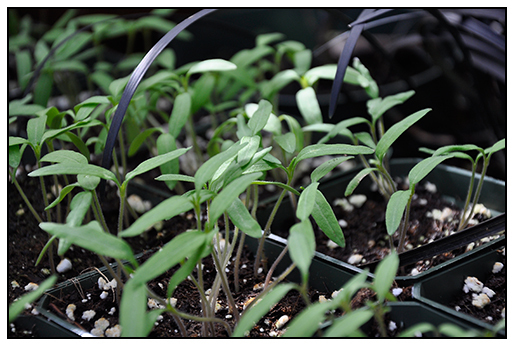 My tomato seedlings were sown on April 14th, and with 24 varieties of heirloom and hybrids, we will have plenty of tomatoes come August. Planted side-by-side a hormone drenched, thick-stemmed home center plant purchased now, these seedlings will win. Try it for yourself and see. Our New England Primrose Society show will be held next weekend at Tower Hill Botanic Garden near us in Boylston, MA. 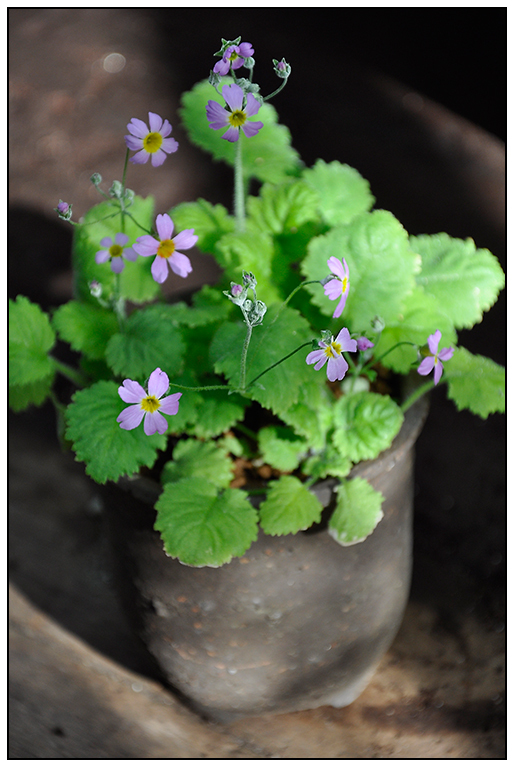 This pot of Primula forestii may still be in bloom, if the weather remains cold, but it is short lived, and may be gone by next weekend. When I came home from work yesterday, I found this scene - Lydia, destroying the pansies, trying to get at a Chick-a-dee nesting box on our deck. 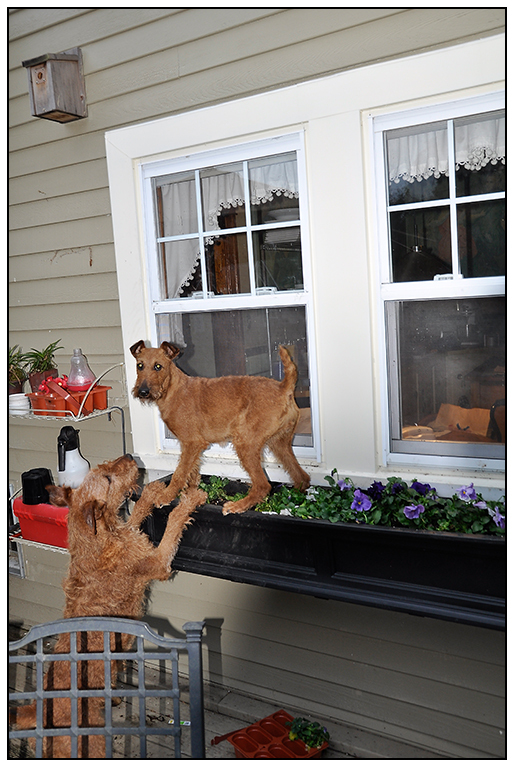 She is like a spry rabbit, jumping up onto the window box with ease. Old Fergus was clearly directing her, hoping to share their meal of a Black Capped Chick-a-dee. ( Please pardon the mess!). 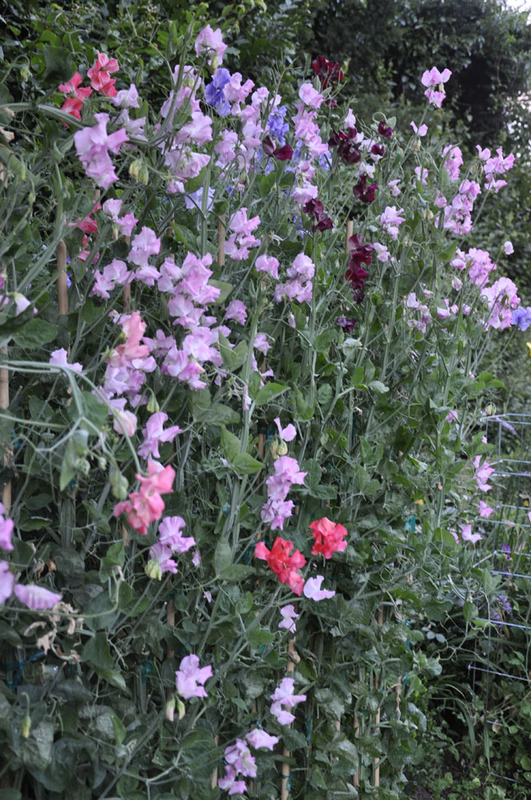 The sweet peas that I started last month are getting large. They have just been pinched back to two sets of leaves, in prep for being transplanted into the garden next weekend. 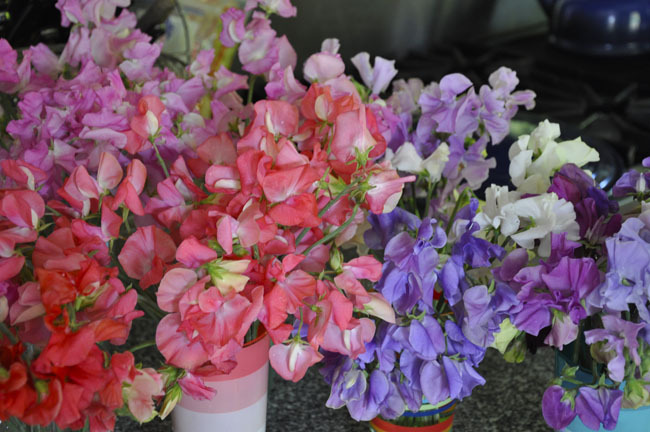 ( I know - I may have over done the sweet pea thing!). 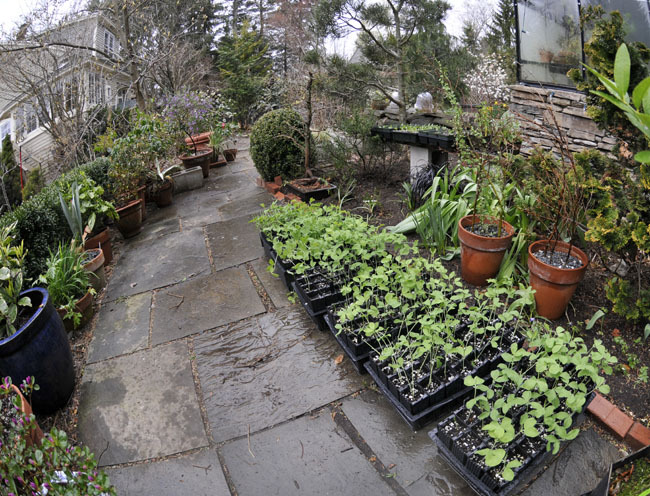 Last night the temperatures dropped to 31 degrees F. which may be the last nip of frost for the next week here outside of Boston, so I have moved some containers back outside from the greenhouse to make room for my annual spring cleaning inside. We host a garden party the first week of May for the American Primrose Society, when they have their show near us at Tower Hill Botanic Garden, and I never seem to make enough time to clean the greenhouse during this horticulturally busy time of year - this year I hope to get the greenhouse looking spiffy. Today I was able to clean under two benches, stack some clay pots and sweep out half of the greenhouse. I filled a dumpster with junk, even though I try to not use plastic, it just seems to grow when you have a greenhouse. Empty bags of sand, old flats, potting soil bags, labels.... enough plastic to fill a landfill - it's disgusting.